(Common Name: Cranesbill, Hardy Geranium). There are varieties suitable for a wide range of uses - ground cover, trailing, mid-border, sun, dense shade. In fact the only situation I've not come across a Geranium to fill is very boggy or in water - but I have a sneaking suspicion there's one out there somewhere. Geraniums are great plants for bees. 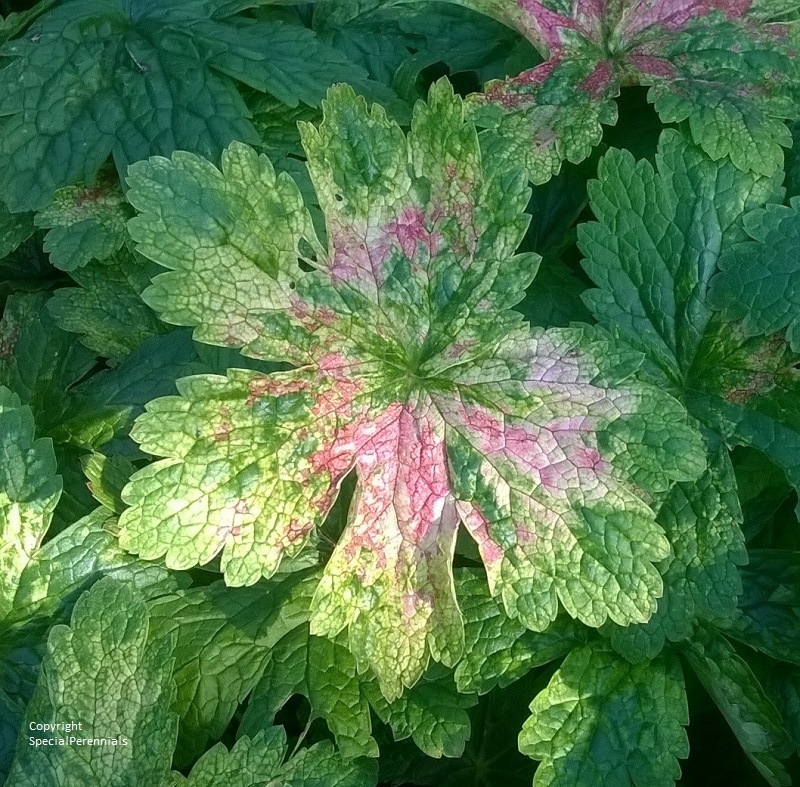 Different species require different conditions and there is a Geranium to suit most gardens. There are quite invasive types among the goodies so read up about them first. Not all "Hardy Geraniums" are hardy! - all of ours are though. Propagation and care differs between species - see below for specific notes. The only specific pest we've experienced is a saw fly caterpillar that makes holes in the leaves in late summer. The common name is a reference to the shape of the seed capsules. Hardy Geraniums should not be confused with their half-hardy distant cousins, the Pelagoniums, which are commonly called Geraniums just to confuse things! A member of the Geraniaceae family. Sanguineum type but with large white-edged pink flowers for a long season. Low mat former and a great edger. Discovered on an expedition by Ness Botanic Gardens, this form has pure white flowers over a very long period - even carrying some flower into the autumn. Unlike other varieties, the leaves are glossy and are not aromatic leading me to suspect it is cross with another species. Delicately patterned flowers and clumping plants that are more compact than other of the type. Good repeat flowring. Height 1ft / 30cm. The star-shaped pink flowers appear from May onwards on plants reaching 1 1/2ft / 45cm. Good repeat flowring. Great for dry shade these plants from neat clumps of large, often patterned leaves and have flowers on top of 2ft stems in late spring into summer and often continue in the late summer, albeit reduced in number. These will self seed, but not excessively but we propagate by division to ensure purity of type. I only divide plants in spring as they don't do well in pots in winter but for planting in the garden they can be divided in autumn. Pure white form with plain green leaves. Rather lovely especially with the sun shining through the petals revealing the star-shape calyx in silhouette. Mosaic-like variegation to the large leaves in yellow and green with dots of red. Rather weird. Flowers are typical maroon phaeum type. Makes a large leaf mound about 2ft tall. Leaves boldly splashed with white, red and silver. Flowers are the typical phaeum maroon colour. Blue and silver flowers like Mother of Pearl on 2ft 6in (75cm) stems. Mounds of divided leaves. Blooms May - July and sometimes again September - October. Leaves like Geranium renardii and pearly pale violet flowers from April - June. Low growing and great in dry and poor soils but give her some TLC and you won't regret it! Needs a sunny spot. This is a cross between Geraniums sanguineum and psilostemon producing a low-growing plants (like a sanguineum) with large, magenta flowers like psilostemon (albeit lacking the black eye). They do well in dry, sunny spots and flower from May through to the autumn with a little rest in high summer. Propagate by division in spring or by root cuttings.